The PHE-5580-20 and PHE-5590-20 are wet or dry steam sterilizable pH electrodes constructed of a durable high temperature thermoplastic with a 316 stainless steel jacket. The outer body is fitted with a 3/4' MNPT mounting thread. The use of a double Porous PTFE liquid junction reference cell and specifically formulated low impedance glass membrane allows use in the broadest spectrum of pH applications. 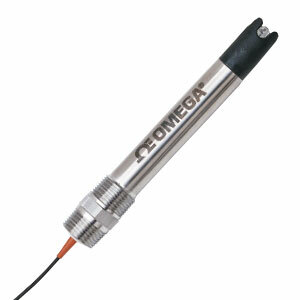 This combination permits extended periods of pH measurement in the presence of poisoning ions, or where membrane leaching would shorten the life of conventional electrodes. 참고: Comes complete with electrode care instruction sheet and 6 m (20') of cable. For non-standard cable lengths, change the "-20" in the model number to the required length in feet, add $2 per foot to price (additional per foot cost applies to the entire length of cable.